Access your Linksys Smart Wi-Fi Router's local access interface through a browser like Safari® or Internet Explorer. To learn more, click here. 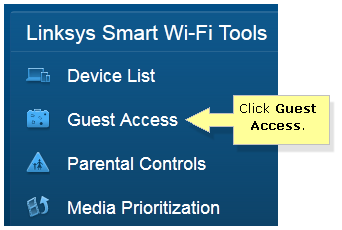 On the left navigation pane, click the Guest Access Tool under Smart Wi-Fi Tools. 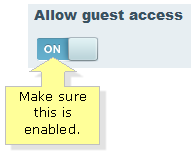 Make sure that the Allow guest access section is enabled by setting the toggle button to ON. Click on Edit to change the Guest network name and password. Enter your preferred Guest network password in the provided field. 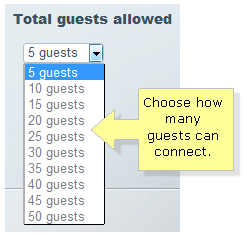 Choose how many guests can simultaneously connect to your Guest network in the Total guest allowed drop-down menu. NOTE: Your Linksys Smart Wi-Fi Router allows a maximum of 50 guests to connect simultaneously to the Guest network.